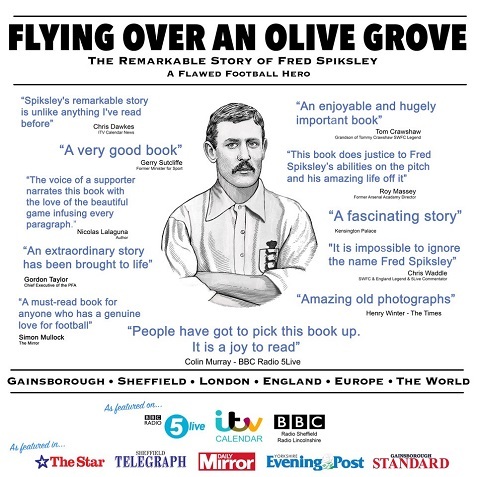 FLYING OVER AN OLIVE GROVE is the much acclaimed biography on Fred Spiksley, a Sheffield Wednesday and England legend from the Victorian Era whose life on and off the pitch was remarkable. 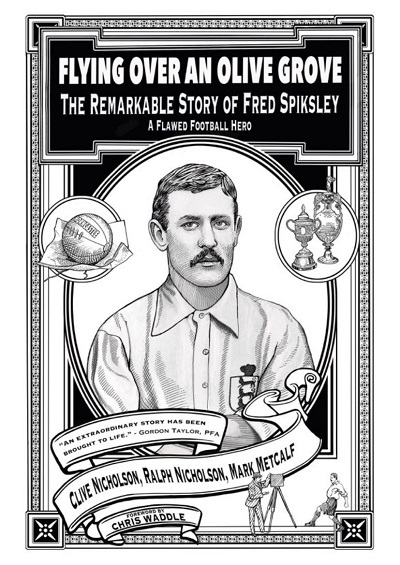 Spiksley scored England�s first hat trick against the Scots and his feat in 1893 had the future Queen (Mary) chasing him down the touchline waving her handkerchief in appreciation. In 1896 he scored both of the Wednesday goals when they beat Wolves 2-1 in the FA Cup final at the Crystal Palace. His first is probably the fastest ever in the final. He notched Wednesday�s first goal and hat trick at the newly opened Hillsborough in 1899. When he retired from playing he became a globe trotting coach and was the first man to coach on three continents, enjoying success on each. He also acted on many occasions alongside Charlie Chaplin and escaped from a German prison at the start of World War I. He later worked successfully with young people on improving their football skills. Spiksley was also involved in a number of scandals involving women and he was addicted to gambling on the horses, leading to him being declared bankrupt on a number of occasions. The book, which is especially great for those who want to find out about the early development of professional football and its characters, has enjoyed praise from Henry Winter, When Saturday Comes, Colin Murray, Danny Baker, Gordon Taylor, Simon Mullock and many more. Work is being undertaken to turn the book into a film. The book contains the following excerpts relating to Tottenham Hotspur. The book can be bought from www.spiksley.com. Fred�s stage contract with Fred Karno ended in May 1907. A month earlier the post of coach/football manager at Tottenham Hotspur had become available. After nine seasons in North London, John Cameron, who had led Spurs to FA Cup glory in 1901, had shocked the club by quitting his post. Fred had immediately applied for the job at White Hart Lane as did Sandy Tait, the current Spurs captain. On Monday 15 April 1907, Fred played outside left at Tottenham for the Corinthians, whose side contained Tait, in a charity match for the Tottenham Drill Hall Fund. Fred had by chance bumped into Wreford Brown, his captain on the great day when England had beaten Scotland 3-1 in 1898. On hearing that Fred had retired from playing, Wreford Brown had surprisingly asked him if he might become involved in the game. �He described it as my swansong and I believe my appearance was the only time a professional footballer played for the famous amateur team,� said Fred later. Spurs won 2-1 but the defeated side�s goal came from Spiksley. �A long dropping shot at the end of 25 minutes,� reported the Daily Mirror. Only 1,000 were present. After what was his final game of organised football, Fred was taken round for a lap of honour by Wreford-Brown at the final whistle. He was given a standing ovation by a London crowd among whom might possibly have been some who had seen arguably his two finest performances, both in London, these being in 1893 for England against Scotland and for Wednesday against Wolves in 1896. After becoming the last Englishman to coach a German title winning team with IFC Nuremberg in 1927 then it was almost time for Fred Spiksley to call time on his globe-trotting career as a football coach. However, he was to receive a final appointment as coach to Lausanne Sports. His time in Lausanne was a mixed one, the club were trying to establish themselves and how much Fred impacted on the club is difficult to gauge. Yet his time there would lead to a memorable encounter with Robert Alaway who, as an Eton schoolboy, had had his first encounter with football when he was among the crowd at the 1893 Richmond international, witnessing Fred score his famous hat-trick against Scotland. Such impact did the game and his new hero � Spiksley � have on the youngster that he spent much of the rest of his life involved in the sport. In 1905 he founded the Middlesex Wanderers football club, who remain famous for their touring of the world. Alaway spent most of his life touring the globe with his football club and in 1948 released the book Football All Round the World in which he retells the tale of meeting Fred Spiksley some 35 years after his life-changing day at Richmond. �My introduction to association football was with royalty; or rather, to be strictly accurate and respectful, it was in the company of royalty that I saw my first game � an international on the hallowed Richmond Athletic Ground between England and their historic foes, the Scots. I shall never forget it. �Since then I have seen thousands of football matches in all parts of the world, graced by kings, emperors, princes, presidents and of course millions of the common kind. But an imperishable memory is that glorious spring afternoon of 1893 beneath the quiet trees beside the gentle flowing Thames. �As for Spiksley, it was not until 35 years later that I saw this great figure of a man again; and that was at Lausanne in 1928. The Middlesex Wanderers had gone there to play Lausanne Sports FC, to whom Spiksley was the revered professional coach. �At the reception after the match I told Spiksley that as a boy in stiff collar and Eton suit I had seen him score three goals for England. He had a remarkable memory for the games he played. Not only did he remember the Richmond international but nearly every movement of the game, and went through every one of them again while my eyes popped and my pulse quickened with renewed excitement. I had completely forgotten, but Spiksley reminded me, that the referee was J C Clegg, chairman of the Football Association, and that he took no notice of the fact that one of the players lost his football boots and turned out in black walking boots. This is the only account that we have discovered of Spiksley�s long distance strike at White Hart Lane, but evidence would suggest that it took place during a London Cup match while Fred was playing for Southern United, which means that Spiksley still had the timing in his legs to punch through the ball in the way we all remember David Beckham doing at Selhurst Park in 1996. Spiksley would have been about 35 when he scored the goal. One of the co-authors of this book was Mark Metcalf, who also co-wrote "The Golden Boot". Mark kindly sent me this extract regarding Jimmy Greaves, along with a similar account regarding Bobby Smith. Mark has now kindly undertaken to send me material regarding Gary Lineker and Steve Archibald, both of whom topped the Division One scoring charts when with Spurs.